Fantasy Author Miranda Mayer: "Her." 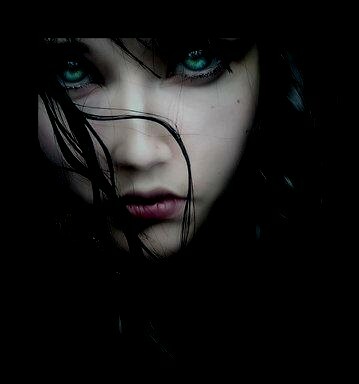 Her darkness attracted me at first. I felt like I belonged to it, and I envied her for possessing such pallid beauty without trying. Me, I had to paint my fingernails black, and to wear black clothes; I dyed my hair pitch coal, and lined my eyes densely with darkness. I brooded; I felt detached, all my life. I didn’t feel connected to the sunnier people; to the giggling and forced nasal speech peppered with the world ‘like’. The shining, well coiffed hair, and fashionable clothes… The overachievers and the jocks, they might as well be from another planet. I was always aware of the whispers and sneers as I passed them by, a guy wearing eyeliner, reeking of wet cigarette. There's a lot to laugh about there. I never quite related to any of those people, nor did I seek to. So I made sure they knew I wasn’t interested in their world by making myself appear as separate from them as I could. They lived in their own world and I made my own. My world included two more souls who thought themselves unique, but were exactly like me. Our universe consisted of a notch in the back wall of the racquetball court building that was shielded by the wind by a row of massive poplars. It was the perfect place to hide. The ground was peppered with butts, and smoothened by the soles of our Converse All-Stars. We were all about wristbands with studded leather and a joint made of hash and tobacco that took us a week to finish. We hardly spoke to one another. Occasionally we would allude to our misery; our troubles, our trials and our shared curse of being chronically misunderstood. There was Kurt, who was gay and angry and Rebecca, who had no idea who she was. Kurt was at least one step ahead of us in our hunt for identity. It was likely on any given day, between classes and at lunch, you would find us there behind the racquetball courts, smoking cigarettes or something less legal, sometimes eating something, other times just standing against the wall, one foot flat on the bricks, knee bent watching the poplar leaves dance in the wind. If it was cold, we would huddle in a circle. We’d share a joint, and I would stare at Rebecca’s striped socks that went up to her thighs and her frayed black denim miniskirt, but mostly at the smooth, pale length of exposed skin of her thighs. She was a nice looking girl, underneath her black lipstick. She had her hair cut in an asymmetrical bob, longer on her left side than the right, and dyed a wine-red. She had a silver stud, a tiny little sphere in her nose. She liked to wear a necklace of little skull-head beads. A string of grimaces. Above them, her pale face. I watched her pupils expand wide, gobbling up the brilliant golden-hazel irises like a lunar eclipse. But next to her, Rebecca was a shade. A shadow. I don’t really remember where I met her exactly. Things are hazy from when I was around her in the beginning. It could have been at the Tower, but maybe not. I know she likes the place. She’s sort of fascinated by it. The Tower of London is neither a tower, nor is it in London. It’s a storefront in a rather defunct part of town wedged between a cheap furniture store and a used book shop facing a secondary, dead-end street nobody drives down. You can’t see inside because the windows are blacked out, and the door is solid wood. All there is to indicate it’s a business is a sign, a really nice sign for what it is, made of painted wood with the letters routed into it, leafed in a darkened, weathered and patinated coppery gold. They used some fancy scripty-looking text; the T and the L elaborate and curly. Inside the door, it’s a cross between a cowboy era bordello and something ripped out of the Georgian period. The walls are draped in deep blood-coloured velvet swags, some edged in gold fringes and tassels. The furniture is equally as ornate and cheesy; upholstered in jewel-toned purple, deep gold, red, royal blue and emerald green velvets and brocades. Hanging on the walls, over the folds and swags of velvet are gold-framed portraits. They’re all ghoulish and dark, some random figure, sallow, dressed in ruffled shirts and cuffs, or a period gown and bodice, dark hair, glaring eyes that follow you. The floor is carpeted in red with gold acanthus leaves woven into it. It’s really just a hangout. It costs five dollars to just walk in the door for the night. Somehow it manages to stay un-dingy, despite the regular Goth traffic that comes churning through here. There are little black-enameled and gold-leafed tables everywhere. A tacky gold-painted sideboard offers tea and coffee from ugly over-decorated urns. Splenda and teabags are hidden in rows of enameled black and gold boxes. There is a sort of bar on the right as you come in, facing the large parlour. You can get non-alcoholic drinks served to you in cut glass stemmed goblets so you can feel sophisticated. And some nights, if you’re lucky, you can get some wine or something spiked, if the owner is feeling naughty. She sometimes serves snacks, but she prefers to keep things simple. There are booth-like alcoves holding large loveseats along the wall facing the bar, and a large one in the back. Behind the swags the speakers usually play Trance to the Sun or some other faded and obscure Goth Rock group. Well, expectedly, the patrons of this place are what one would imagine. Kids like me; acting out the melodrama of our lives, baleful gazes and eyeliner; dyed hair, piercings and sorrow. I would go there with Rebecca, we’d choose one of the many cozy alcoves along the wall, sit in the plush loveseat and make out. I’d tell her that she was beautiful. She’d tell me she liked my docs. It suited us. Now I look down on the Tower from above. Across the street from it is the back of a large bank-building. We're on the roof of the high-rise, gazing down. It’s hot tonight, so a lot of the kids are outside, smoking. They’re about eight stories down. There’s a girl who calls herself Elora, bright red lipstick, more Rockabilly than Goth, sleeve tats and a mole drawn on her upper lip with an eyebrow pencil. I like her hair. She has it forties style, with the bangs and all. She looks like a pin-up, glossy patent red leather corset and all. It seems to work with her black cargo pants and doc martens. Kurt’s there with her, they’re sharing the same cigarette, bitching about something. Rebecca is inside the Tower, making out with someone else. She is beside me. She is fascinated with the place. She doesn’t speak of it, but if I need to find her, nine times out of ten, at sunset she’s here, gazing down at the Tower. She never goes in, but she likes it most when the occupants are outside so she can watch them. There’s a smudge on her cheek. I want to reach out to clean it off, but she doesn’t like it when I touch her. Behind us, the door to the roof utility shed is still open, and the light bulb is still swinging. It brings back the image of her face, only a few moments earlier. The swinging light made everything strange. Swing; her face is a skull, swing, she’s magnificent, swing, she’s a lost child, swing, she is God. Her eye-sockets looked so hollow for that second, it scared me. Her skin is so white it might as well be bone. Now in the full of the night, she’s back. She’s vibrant. Fresh from the kill. Our quarry is lying on the floor, on his side, his back to us. The pendulous light only seems to touch the folds of his clothing as it swings. She looks playful. A smirk on her unnaturally red lips. “Before we move him, let’s play a game, shall we?” Her voice is like the velvet from the Tower’s walls; older sounding than her face, husky even, with a lilt and maybe a shred of an accent I can not identify. She doesn’t like to leave our kills here. She likes it here too much to bring attention to this spot. We usually move them to other locations where they won’t be found. My interest is piqued. I still like games too. She is wry as she looks at me. Her lion’s mane of shimmering blue-black tube curls frames her heart-shaped face and tumbles down to the middle of her back. Her eyes are ringed in long black lashes that would be the envy of any woman. She’s wearing smoky-eyed makeup tonight. Her eye whites pop, her irises look like hematite. She’s dressed in a simple white, billowy sleeved blouse with the buttons open to her cleavage. A jeweled pennant hangs just above the cleft, a rosette of filigree with small stones imbedded in it. She has slacks on with long cuffs that fall over a pair of black leather boots with a round forties toe and a thick heel. She could be any woman; except for her exceptional face. So beautiful. I catch just the tiniest glimpse of one of her canines as she smiles. She’s good at hiding them. “Follow my lead, grasshopper,” and without any notice she jumps off the edge of the building. My pulse would have quickened had my heart still been beating. I gazed over the edge just in time to watch her land right in the center of the street, between Karl and Elora and four other kids who were standing on the opposite side of the street. Her boots make a loud crack as she hits the ground. She hits it hard; I’m surprised her heels didn't break off. She lands in a squat, her hand touching the pavement, white like a snowflake against the tarmac. Our chase scene is over. We sit on the building’s edge enjoying the aftermath, our legs dangling over the side. Nobody can see us even if they are looking up and pointing at where they thought we’d come from. She is grinning. The whole patronage of the Tower had come out to the street hoping they’d get a glimpse. They were filtering back inside, Elora still weeping tears of joy. She sighs. I think sometimes, she wants to be down there with them. She wants to be like Elora. She wants something to believe in. I leave her there, she always lingers until they close and kick everyone out. She can move the kill on her own. She's strong enough. Oddly, she never kills from this group--the Goth kids of the Tower. Except me. I feel angry for a second, but it quickly fades away. She treasures them. Maybe she treasured me. All those times Rebecca and I came and went, I imagine she was up here, watching me. Maybe I am her part of the Tower. Her part of that world. Now I look nothing like it. I look like those kids who I could never relate to. The ones I wanted nothing to do with. A pretty-boy. It’s hard not to laugh at that. I glance back and she’s still sitting there, the breeze picking up some of her curls. “Sleep tight,” I whisper, and she hears me. A nod. “See you tomorrow night.” She’ll be here. As long as the Tower is. Little deity, watching over her flock. Thanks! :) I intend to start posting more of my short works here and there. Just to give people an idea of my writing style. Positive feedback is always nice! This is powerful stuff. You have amazing talent.